Looking for a bus in Skokie? Chicago Charter Bus Company has access to hundreds of buses to take you to Skokie Northshore Sculpture Park, Emily Oaks Nature Center, and more. Living so close to Chicago has its perks. You’re just outside the hustle and bustle of the city so you can enjoy the quaint village lifestyle without feeling isolated; but when it comes to going out to concerts, sports games, weddings, and other happenings in Chicago, sometimes upgrading from a carpool to a private chauffeur just makes sense. Not only does the whole group get to enjoy the ride together, but when you’re attending events that include alcohol, having a professional driver behind the wheel is both responsible and fun. When you want to venture out of Skokie with a group, considering renting a modern minibus from our network. Minibuses that hold up to 18, 20, or 25 passengers are available, and each vehicle can be customized to your liking when you add on premium amenities. Whether you’re heading across town to The North Shore Center for the Performing Arts or into the city to Wrigley Field, do it in style with frameless windows, a high-quality audio system, and leather seats. Just ask your booking specialist which amenities are available with your preferred vehicle size. We take pride in the reliable buses we charter. Not only are these premier buses checked and double-checked for safety, but they also include ADA accessibility if that’s a necessity (just ask your booking specialist). 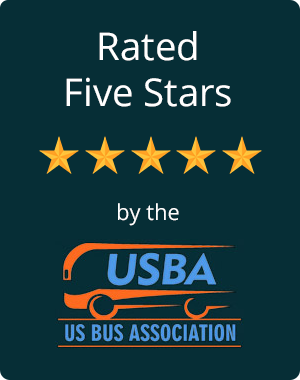 Your driver’s priority is getting your group to its destination efficiently and smoothly, and we are proud to report zero accidents since we began operating. For school events, sports teams, and education-related travels, we recommend looking at the 56-passenger charter buses and 25-passenger minibuses available. Both vehicles are roomy and feature plenty of convenient storage for student belongings, lunches, sports equipment, and other baggage. These buses are also great choices for conventions or corporate events that require professional and reliable group transportation in the Chicago area. Clients often book the smaller minibuses for Chicago weddings, church outings, corporate airport shuttles, and the like. Whatever your needs are for a private driver and spotless vehicle, just let your booking specialist know, and he or she will find the perfect ride for your event or occasion. If you're keeping clear of the city and instead venturing to other Chicago neighborhoods, we've got you covered! Chicago Charter Bus Company also services Arlington Heights, Elmhurst, Northbrook, Oak Park, and other nearby areas. Want to learn more about our charter bus rental prices in Skokie? Check out our average rundown of pricing for a few different options, but the best way to get an accurate price is to call us today for a quote. We are available at 312-667-0906 all day, every day to discuss your group transportation needs with you. You can receive a quote within minutes and book immediately or later—it’s all up to you.